Keith Urban announced the release of a new studio album yesterday. After scoring a number one with “John Cougar, John Deere, John 3:16” a couple weeks back he sent a second single off Ripcord to radio last week. “Break On Me” is slower than nearly all of his songs in recent memory. You’d have to go all the way back to “Only You Can Love Me This Way” in 2008 to find something with a similar sound. Because of such, Urban has the chance to capture fans who might have been tuning into country radio five years ago and grab them with something that really doesn’t sound all that different. That being said, I think “Break On Me” is one of the better songs released this year. Keith has been on a role since the release of Fuse – an album that produced five top five hits. “John Cougar, John Deere, Joh 3:16” showed he can keep up with the changing sounds within the genre, but this song shows he’s not afraid to go back to his roots. 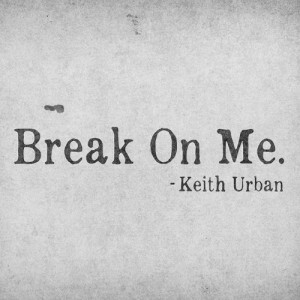 Just like the words he sings, Keith is one of those artists you can count on to produce hits left and right.